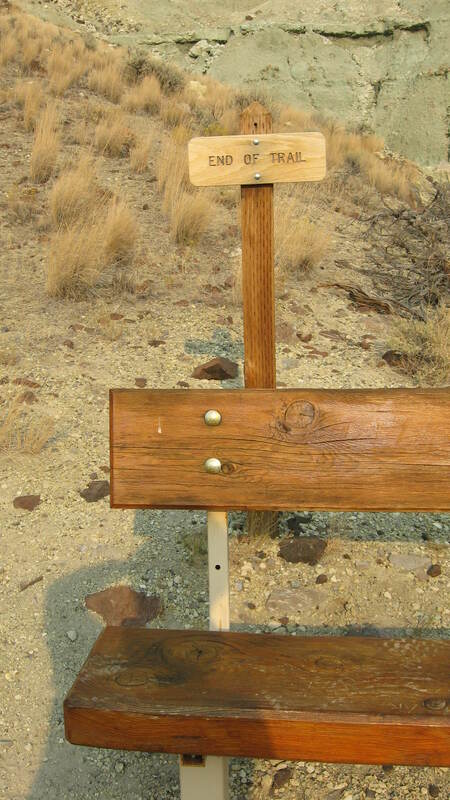 It seems entirely ironic, yet appropriate that I should land on an old wooden bench flanked by a sign that’s written with the words: “End of Trail”. I am sitting in the middle of John Day Fossil Beds National Monument, Oregon dwarfed by prehistoric cathedral like rock formations of crimson colored basalt, ashen gray tuff, and weathered copper green clay stone–six million years of history embedded in the stone walls around me. I feel like am being watched. September here bakes the clay, burns your skin, but for the dry gusts of strong breeze that envelope you and stroke your face, play with your hair. It feels delicious and I am suddenly and overwhelmingly taken with the desire to meditate. I am being seduced and played with as each whoosh of wind pushes itself up against me; as I am sung to by leaping grasshoppers as they chirp happily away in the brush.. I close my eyes. I am near approaching heaven in this one magnificent moment. Life and death and life again. Breathe and I find myself hurtling back in time from present moment of sixty years on this planet. Back, back through my 50’s and I am sitting with friends blowing out the candles on my 50th birthday cake. Yanked again quickly through years of my 40’s finding my way in a brief marriage, the beginning of long term chronic illness and near death that crossed into my 50’s. Now in my 30‘s asking life who I was, a single mother, life lived on foreign shores, losing my father. I‘m now returned to my 20‘s, a young wife and mother full of responsibility. My life had been neatly mapped out, or so I thought. Answers were easy then. Here I am in my teen years listening to Bob Dylan and Joan Baez, sneaking out the back door late at night, writing poetry full of first love, angst and anger and war. A girl now, I am living in my parents house, running out the door to play with my friends, building rocket ships to the moon in a cardboard box, peering into a juvenile microscope in wonder of the world beneath the glass or gazing into the night sky, able to name every star formation while dreaming of time travel and parallel universes. Going further back I am a little girl of two standing in the doorway of a big white house watching men in white coveralls as they brushed lemonade yellow coats of paint on the kitchen walls. And here I am an infant lying in my crib watching my parents and grandmother tiptoeing through my green walled room on their way to the kitchen. Pulled away, I am floating inside my mother’s womb. It is so silently peaceful here, and the whoosh whoosh of her beating heat reverberates throughout me. All this imagined in the space of a moment or two, I don’t know, I lost track of time as I hurtled out my mother’s womb into the silence of life between lives. Floating again for a time, as if waiting before being yanked back and back past lives and lifetimes of great pain or torture, laughter, aloneness, families, starvation, drought, abundance, death, dying, war–all the million and one things that comprise a life. I am pulled past planets, racing through the Milky Way and galaxies and life ejected from unimaginably hot and violent nurseries of forming stars, sucked backwards in a colossal explosion of light and fire as it reels backwards upon itself into a singular pin point of light. Silence. Nothing. A void where neither right nor wrong exist, without form. There is a dream going on, many dreams like plays on multiple stages. Am I the dreamed or the dreamer? Lifetimes and galaxies, universes and all matters of form rolling out in thunderous sharp cracks and deep bellows of hearty laughter, bells in every kind of clang and ring were singing and lightening splintered and split through each dream, each splinter a different dream of form and being. Electric life force dancing, deciding here to become this thing or that, dancing in the wings of a bat, the beating heart, the wind’s roar, the cry of an infant in his mother’s arms. Again and again expanding and animating, contracting in life and death of everything that is. Everything already exists in this void. Dreams upon dreams upon dreams, coming and going, passing in and out, rise up, fall down again from this primordial soup. It’s all there. I still feel the wind. I feel the hill I sit upon undulate and roll beneath me, and I give myself to the possibility that ground beneath me might dissolve, that whatever molecules and atoms that hold this whole thing together might suddenly change the dream. And I am okay with this. Rivulets of sweat run down my backside then rapidly evaporate into salty stains. I am not aware of time but I feel the sun changing in front of me while I dream. Not a bug or a fly of distraction lands on my skin, or maybe I just didn’t notice. Slowly I open my eyes. The furnace like heat of the day is settling and the sun casts long shadows across striated green hills. Arising from my position in front of the “End of Trail” sign, I begin a meditative descent on the trail towards the car, as I imagine how easily rooted we become in whatever imagining we each find ourselves. People, tribes and whole nations dream, divided one against the other, aiming weapons and hate at anothers dream. “My dream is better than yours,” we say, “your dream is wrong”. We are all sleeping. I am taking a lesson this day from the whole of the natural world around me. One tree does not attack the dream of the other, but waits in accepting silence for the axe or the lightening strike or fire. One mountain does not fight over land with another. If there is coalescing of space or place, or life is to be snuffed out like the candle’s flame, it is done in the natural order of things…nature giving up its life when the appointed time of dreaming ends. Sitting outside the dream for the briefest moment startles me out of my suffering. I do not make appointments with this inexplicable event but am chosen by some cosmic witch doctor who decides I need a good jolt of caffeinated double shot juju to come awake or heal from attachment to another’s dream. Who knows exactly why? Maybe I’ve just been doing a whole lot of going along to get along and need an icy cold cup of water thrown into my face. Maybe it might be my intense suffering or pain that calls it in. Whatever, it always arrives totally unexpected, unbidden, unsought. I am always left changed, shaken out of doldrums and/or a brain run amok. It alchemicalizes my existence from complaint to holy gratitude, it rewires my brain, exchanging the everyday profane for the mysterious sacred. Life suddenly is realized for the Holy Grail that it is, and I can see myself anew. I look into another’s eyes and come to see myself in a different way. It is as if I am arriving on the shores of life for the first time. Categories: Cosmos, Meditation, Mystery | Tags: belief, cosmos, creation, dream, fossil beds, grace, life, light, Oregon, peace, reincarnation, spirituality, truth, vision | Permalink.